A production with Massachusetts origins is hoping to walk away with a Tony Award this weekend. "Waitress" is a smash hit on Broadway and up for four of theater's highest honors, including Best Musical and Best Original Score. "It's just, I think, a story that resonates with people. It's a lot of hope," said Executive Director Diane Quinn of the American Repertory Theater in Cambridge, where "Waitress" got its start. 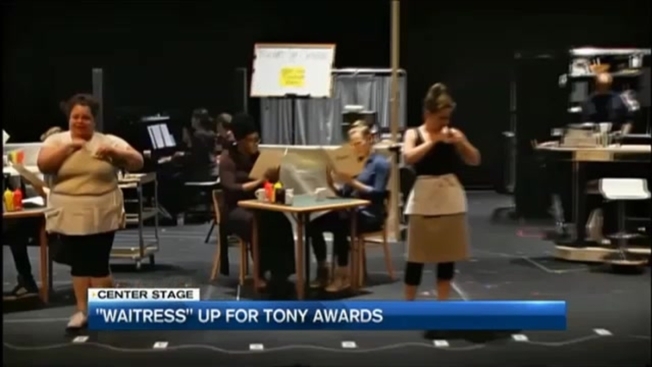 Necn caught up with its powerhouse cast and crew last summer, including Sara Bareilles, whose music is up for one of those Tony's. This is also the first Broadway show with an all-female creative team. "There's some kind of an energy that's happened in that team and it's just made it really really successful," Quinn said. The show marks yet another achievement for a theater that has gained a reputation for developing new musicals. "I think the main thing really is the recognition of the hard work that gets done here in Cambridge," Quinn said. "It takes a lot of effort to get something new off the ground, musical or straight play." In addition to Best Musical and Best Original Score, Jessie Mueller and Christopher Fitzgerald are up for Best Performance by an Actress in a Leading Role in a Musical and Best Performance by an Actor in a Leading Role in a Musical. "Waitress" has a little bit of Tony Award competition, though, with "Hamilton" expected to have a strong showing.